The UCMP is primarily a research museum and thus our collections are only open to the public during our annual open house on Cal Day. 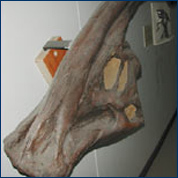 However, we do have a limited number of fossil exhibits on display outside of the collection. These can be viewed, free of charge, any time the Valley Life Sciences Building is open (see building hours and location). 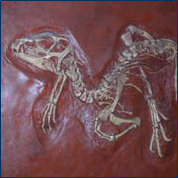 Note that these displays are made of casts from the original fossils, which are often too heavy for display purposes. 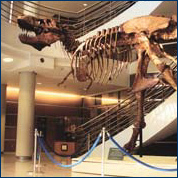 A freestanding mount of Tyrannosaurus rex is at the centerpiece of the atrium. 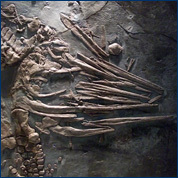 The skeleton of Stenopterygius, a Jurassic marine reptile, is located south of the T. rex. 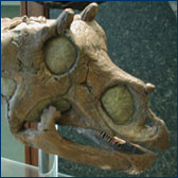 A skull of Edmontosaurus annectans is just outside the Museum’s front door. 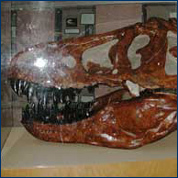 A skull of another T. rex sits at the foot of the main staircase. 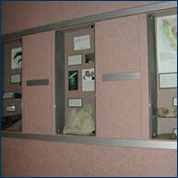 Six small display cases exhibit fossils and dinosaur material from the Cretaceous of California. Living relatives of Cretaceous plants are in the planters on either side of the entrance to the University and Jepson Herbaria. 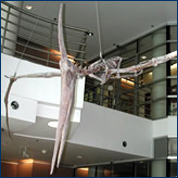 Suspended above the T. rex, and with a wingspan close to 22 feet, this Pteranodon ingens soars above the T. rex in the circular stairwell. 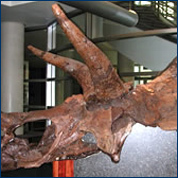 An adult Triceratops horridus skull is found just inside the BioSciences Library. A cast of the smallest Triceratops skull ever found, alongside the adult. 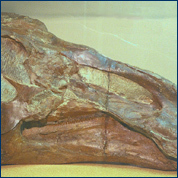 A skull of Parasaurolophus walkeri, a crested hadrosaur from the Judith River Formation of Saskatchewan, Canada. Heterodontosaurus tucki, an early ornithiscian dinosaur from the Triassic of South Africa. 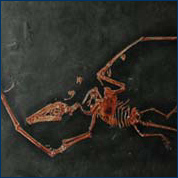 Campylognathoides liasicus, an early Jurassic pterosaur from Germany. So, where is the real museum? We often hear this question. By this, people usually mean, “Where are the physical exhibits displayed?” By definition, museums are devoted to the collection and preservation of objects which might otherwise be lost to future generations. Public exhibits are very important for most museums, but are rarely the primary purpose. As the state repository for California fossils, UCMP’s research collection is extensive and is of tremendous importance for researchers. Guided tours, accompanied by a graduate student docent, are available for school and youth groups during the academic year. 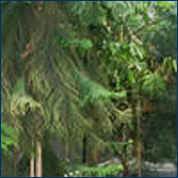 The tours are scheduled upon availability of a docent. Find out more about these tours.